KFC Georgia Gold Chicken - MINING FOR HONEY MUSTARD! 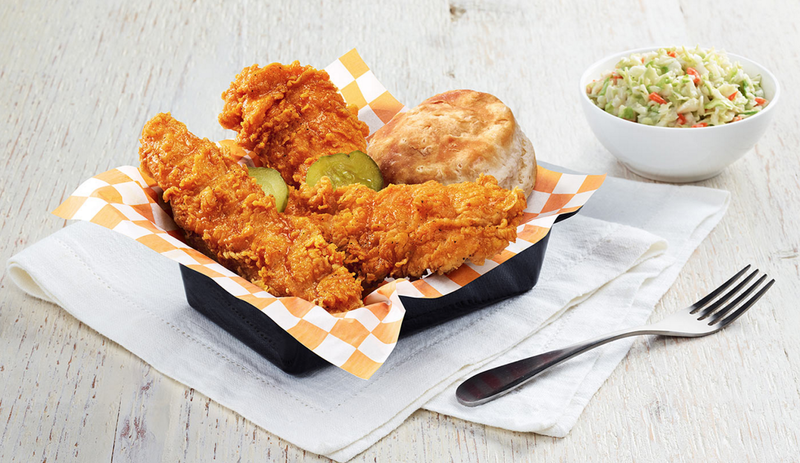 As advertised at this year's Royal Rumble and Super Bowl, Kentucky Fried Chicken is now serving their NEW Georgia Gold Chicken. Available with Extra Crispy Chicken, Extra Crispy Tenders or on a Chicken Little sandwich, this bold new item is smothered in an ultra-tangy honey mustard BBQ sauce and served with pickle chips. We tried the Georgia Gold with the Extra Crispy Chicken Tenders alongside a biscuit and side of coleslaw. The sauce tasted not at all like we expected. Unlike most traditional honey mustards, this sauce focuses way less on sweet honey and way more on tangy mustard. The sweetness was very muted (and tasted more like sugar than honey) and the mustard notes were very pronounced, vinegary and bordering on too sour, which made the inclusion of pickle chips very curious (probably something to do with traditional Georgia BBQ?). Overall, we enjoyed the flavor the more we ate it and there was a very pleasant, subtle spiciness that lingered after every bite. The best part of the Georgia Gold Chicken was the extra crispy texture and KFC's signature secret blend of spices on the chicken itself, which really doesn't say much for the vivid new BBQ sauce. Georgia Gold Chicken is pretty tasty, but it's unoriginal and uninspired and really we would rather just dunk some naked tenders into a tub of KFC's original honey mustard.